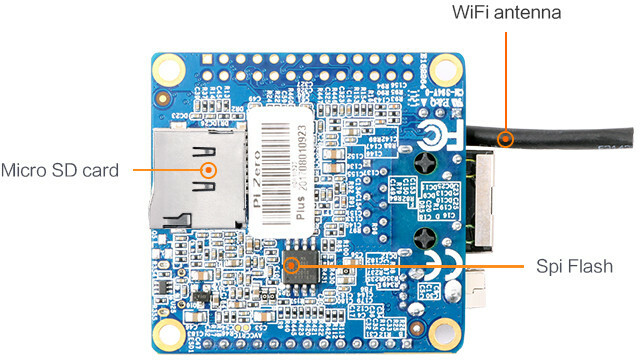 We had Orange Pi Zero, followed by Orange Pi Zero Plus 2, then Orange Pi Zero Plus 2 H5, but now there’s another “Zero” model that’s called Orange Pi Zero Plus, which like Orange Pi Zero Plus 2 H5 board is based on Allwinner H5 processor, but adds a faster Gigabit Ethernet port, and offers a fairly different features set compared to the first Orange Pi H5 board, albeit in the same form factor. The eMMC flash is gone, but has been replaced with an SPI flash that should allow for network boot without micro SD card. HDMI output is gone, so your only video output option would be via the video composite signal on the 13-pin header. Bluetooth is gone as they replaced the Ampak module by a Realtek one, and the camera connector. All those differences means the two Orange Pi H5 boards have different uses case, with the new board is better suited to headless application where you need Gigabit Ethernet connectivity, and potentially want to save a few dollars on the board price, and remove the need for storage (if you use network boot). The board should also be compatible with Orange Pi Zero NAS expansion board, so you’d have an inexpensive micro NAS with performance and price that rivals with FriendlyELEC NanoPi NEO 2 NAS kit, minus the enclosure. 2017 has been an exciting year for affordable networked storage so far, with various options from the two lower-end solutions aforementioned, to the better upcoming ODROID-MC1, and the higher end EspressoBin board, with some interesting work also taking place on ROCK64 board. Software-wise, it may be worth noting that there’s no stable Armbian build so far, but there are experimental Ubuntu Xenial images for Orange Pi Zero 2 H5 board with mainline Linux kernel, which should work on the new board by just changing the DTB file. However, I did use NanoPi NEO2 with Allwinner H5 as a OpenMediaVault NAS, and it worked well enough, so I would not worry too much about software support for this use case. I’m not sure about U-boot support in the SPI flash, but hoping for some feedback in the comments section. Orange Pi Zero Plus is sold for $14.90 plus shipping ($18.29 in total here). If you’re interested in mini NAS / home cloud system, you’ll need to add the NAS expansion board for $6.98, which in my case brings the total to $27.13 including shipping. A direct comparison with NanoPi NEO2 NAS kit is not possible, since Shenzhen Xunlong micro NAS solution does not include a case, nor heatsink, but for reference, a complete NAS kit v1.2 with NEO2 board goes for $28.98 plus shipping, or $44.98 in total in my case. Lots of low cost linux boards, but no one seems to have targeted low power. Not enough interest / applications? It depends what you call low power. Several boards comes with battery charging circuitry, and can be powered by an external battery. What do you have in mind in terms of power consumption / project? It looks like this OPi Zero Plus is an original OPi Zero with the H2+ replaced by H5. Ethernet is upped from 100 Mbit to 1 Gbit. I don’t know the TDP of ARM processors, I normally just measure the whole system power consumption. But if you want to lowest possible power consumption for Linux, ARM Cortex A5 / A7 / A35 should be the way to go. Power consumption also depends on the manufacturing process (low power vs performance). You can also limit power consumption yourself by adjusting the max CPU frequency, and other tricks for the whole system. You could dent your wallet with NanosG20, SBC. “512 MB Flash and 128 MB SDRAM” that will make it tough to run a desktop, except with really lightweight distributions like Puppy Linux. Placing an SPI flash is good, but if they had put 8 or 16MB, it would have been possible to install small footprint distros like OpenWRT. I’m not even sure there’s a measurable price difference between 2MB and 8MB. Another point, I still prefer the NanoPI NEO2 design for the same price, as it places the CPU at the bottom, making it possible to place a heatsink, which is not possible on this board. This one could be useful to build small access points however. I would consider this Zero an upgrade of the 1st one, so only differences are H2+ vs H5, Fast vs. Gigabit Ethernet (no PoE option any more) and XR819 Wi-Fi replaced with RTL8189FTV. Performance wise the board is comparable with NanoPi NEO Plus 2 (since voltage regulation allows switching between [email protected] and [email protected] — NEO2 is limited to 1.1V). Wrt software support this board is also pretty much the same as NanoPi Neo Plus 2 (one led is on a different pin and Wi-Fi/BT is different). I don’t think we’ll see H6 PCBs that small simply due to heat dissipation concerns (large PCB needed to dissipate heat into the ground plane) and according to some information I got recently it seems H6 upgraded most IP blocks so it might take some time until linux-sunxi community will keep up. I put in an order for one. If Armbian needs someone to try things out, I’ll be glad to do so when it arrives. Do you suspect that, given the small size of the board, that the higher voltage (and clocks) will be useable for more than a second or two at a time? Did Armbian ever do that on the Orange Pi One? If so, I missed the change. I don’t mind either way. Just because the board designer included it doesn’t mean it’s useable. Get a new wifi card is probably a good thing. Is there I2S pinout now ? The problem is still to get a good armbian distrib which exploit the hardware in the good way. Many boards orange pi is not afraid to lost their consummers ? I have got a NanoPI NEO2 too, and I like it much. However: although the CPU has a heatsink, but still CPU temp is around 45 degrees celsius. When I do a “make -j4”, the temp goes up, and then the NanoPI NEO2 locks up … very hot. I’ve put a real size fan on it: CPU temp dropped to 25 degrees Celsius, and the “make -j4” went OK. So now I’ve ordered a 4cmx4cm 5V CPU fan on ebay. I do like the OPi Zero form factor, but I’m not a fan of H5. Maybe if the wifi is a bit more srable this’ll be worth it, but I’ll skip it for now. Use NanoPi NEO 2 for I2S, it’s almost the same board as Orange Pi Zero Plus. @cnxsoft I’m a keen reader but I must have missed the boards that have battery management. I have the lolin ESP32 with battery, could you remind us what the options are for off-grid ARM, please? On all those small NanoPi and OrangePi allowing the CPU to clock at the upper limit is no problem once throttling is active (currently not the case with Armbian and H5 since we wait until mainline kernel situation stabilizes). The only exception was NanoPi NEO PCB rev 1.0 where we decided to limit max cpufreq to 912MHz since this PCB rev locked up under heavy loads with heatsink applied (w/o heatsink everything fine, throttling did the job but with heatsink a LDO regulator U7 most probably was responsible for overheating then — all fixed in the meantime with later PCB revisions). When I tested a while back with identical antennas and almost identical environmental conditions (living in a city with overcrowded 2.4GHz band close to impossible to test with identical conditions) RTL8189FTV performed slightly better than the usual AP6212 used almost everywhere else (only client mode tested though). As usual any MIMO capable USB Wi-Fi dongle with at least 2 antennas will show better 802.11n performance anyway. But for a 1T1R wireless solution RTL8189FTV performs quite well. I2S on Orange Pi Zeros means being good at soldering since the needed pin is IIRC used for Wi-Fi power, better choose a NanoPi instead, there you get also a stackable I2S DAC. There are others. While searching, you’d have to ignore “RTC battery header” since there are quite a few of those. That’s an option too. I completely forgot about that board. You hardly hear of the Sparky SBC ( Quad A9 1.1GHz) from Allo.com either. However this is already a larger problem: the u-boot for sunxi does not yet support booting the kernel from SPI flash (unless this changed recently). So even if you had 8MB or 16MB of SPI flash, you can only load u-boot from it, you cannot yet boot Linux. There are many Cortex M boards. But you won’t use linux on these boards. you can only load u-boot from it, you cannot yet boot Linux. From what I’ve read there, it’s supported but disabled by default (they explain how to enable it and use it). If youre wondering, Xunlong is really a gift shop where you can buy an orange pi board to sit on your mantel, tinkerers can attach a magnet and post it on your fridge. At least thats all i was able to do with their products. Yes, with Allwinner H2+ and Realtek RTL88189ETV WiFi module. How I hate this carelessness. There exists no ‘88189 ETV’ (but both 8818 and 8189 exist). Based on the picture it seems they’re talking about RTL8189ETV so at least Armbian legacy Zero OS images should work out of the box (since autoprobing SDIO bus and loading the appropriate driver for Wi-Fi) given the used USB-Ethernet chip is supported by legacy kernel (looks like RTL8152 but who knows?!). Then situation with mainline kernel looks promising too since there’s an out of tree 8189es driver and whatever USB-Ethernet chip is on the board should be supported. Today a dev sample arrived. Quick review: everything as expected!